For our cycle touring adventure in France (and a little in the UK), we would have to tackle the trains at some point to make the big jumps across the country. In effect hopping from one region to the next since we hadn’t the time to ride everything. It became a much more complex venture than we could have realized at the time. Partly from trying to keep the costs down and partly from wrangling bikes on and off trains that don’t seem to be necessarily improving in their bike friendliness. The first step was finding the best deals on what could very quickly have turned into a major expense. From England to France we’d decided to take the Eurostar. If you want to get a deal on this train I suggest booking ahead. Waaaaayyyyy ahead, at least two to three months (and that could be said of all the train bookings we made). 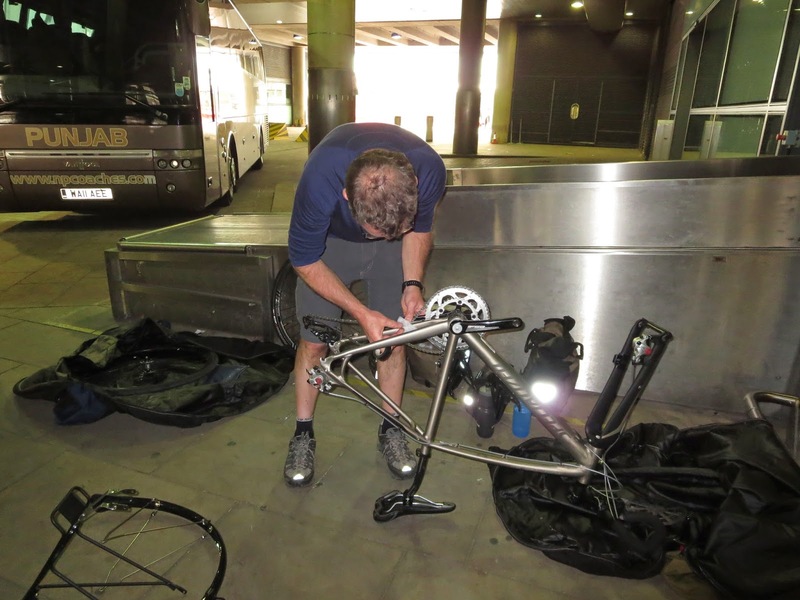 Then you have to decide whether or not to take the bikes on board fully assembled. If so it’s a hefty £30 one way for each bike and the only way to guarantee the bike will be on the same train as you. 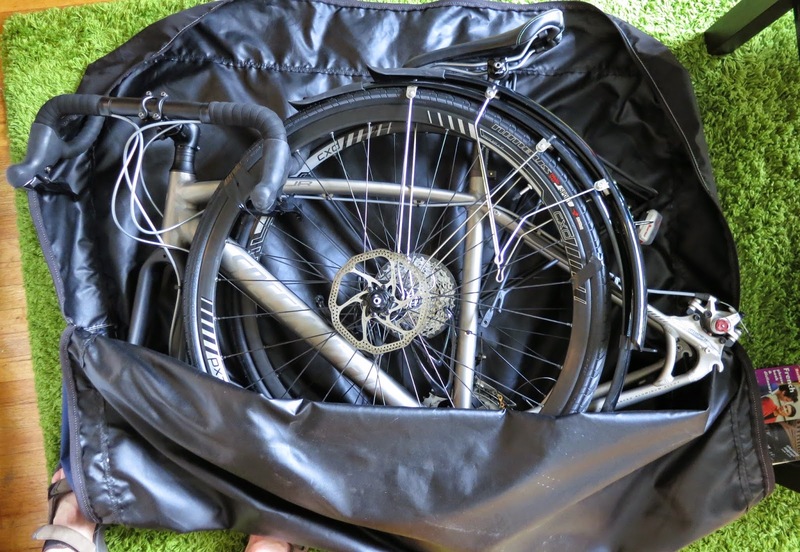 Check out the details here: Eurostar and bike travel. Being cheapsters we opted for the £10 option, which meant dropping the bikes off a couple of days before to assure they’d be waiting for us in Paris. Couldn’t think of a much worse situation than finding our bikes had been delayed by a couple of trains or so due to lack of space. All connections vaporizing into the air! 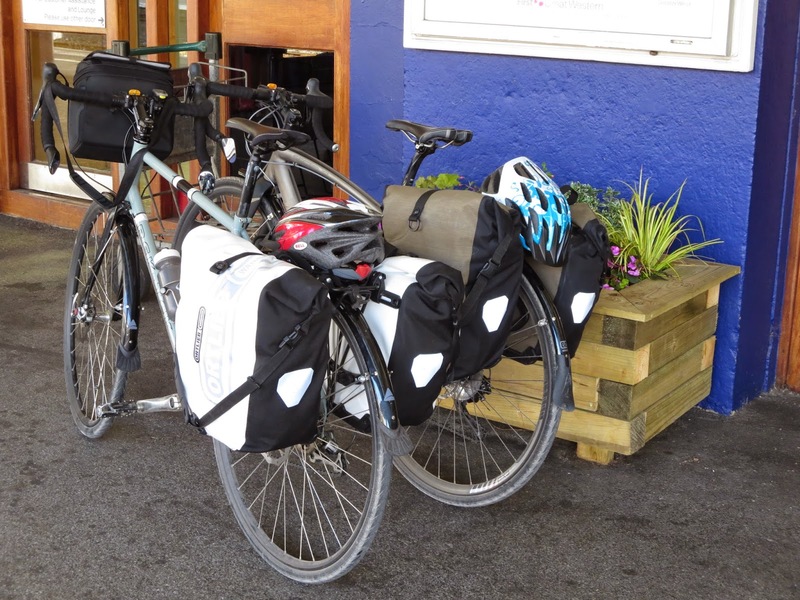 Our course of action also dictated that we’d need very specific sized bike bags, lightweight to carry with us throughout the trip, but strong enough to provide some protection. Since we couldn’t find any to buy that matched our specs of durability and weight, we made them. 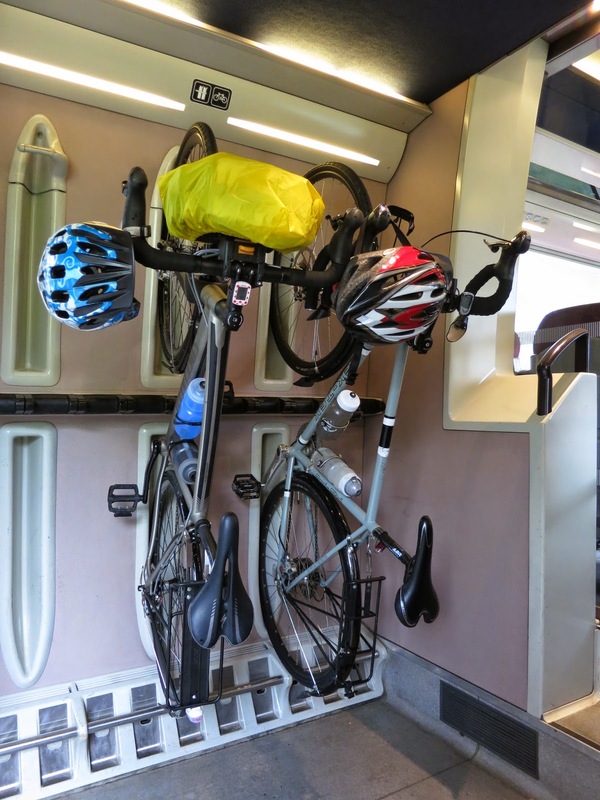 They’d prove to be a bit of a lifesaver – there are limited TGV’s in France that take bikes assembled and there’s a small reservation fee – by bagging them we could take any train we wanted. This did mean of course taking the bikes apart and putting them back together again. It seemed to keep the Eurostar staff entertained at St.Pancras as pieces of bike, tape and tools lay scattered around outside the luggage drop-off. 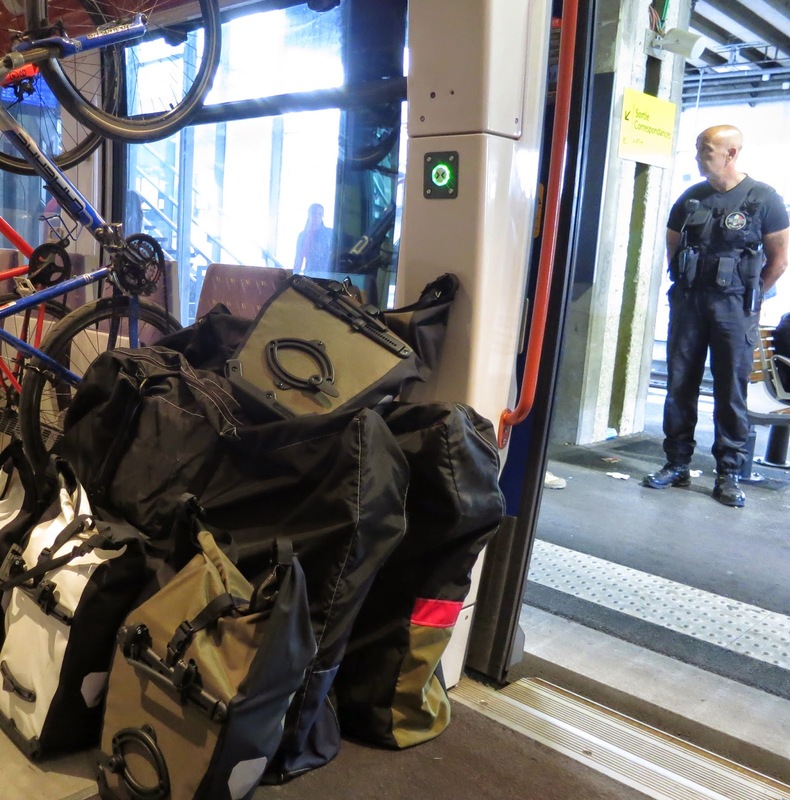 Wrangling the bikes onto the TGV at Gare du Sud was something else. Packed with tourists and commuters, we raced as quickly as we could to our designated carriage (difficult with two unwieldy bike bags and four panniers) and tried to jam our bikes onto the luggage shelves. If it weren’t for the kindness of other travelers we might never have managed. Helping to rearrange cases and rucksacks, they made room for us. The TGV is great, fast, efficient and generally comfortable (if a little cramped). I just wish they had more room for bikes, assembled or bagged. Prices vary for the TGV tremendously, the best deal we found was through a great site called Loco 2 train travel. Easy to use, I had to call them to clarify a point and they were friendly and helpful. Once you’re on the local trains in France, the TER’s, then life becomes a little easier. Free for bikes, the only downside is if it’s busy. Although it was touch and go a couple of times even then we managed to jam on (successfully ignoring the sulky eye rolling of tired teenagers out of school). Then it’s all about comparing the different bike rack systems. Of the Intercités trains in France (fast trains that link major cities and towns) that take bikes some require reservations and a small fee. In blissful ignorance this important nugget of information had passed us by and it was only by looking pathetically desperate that a stern conductor allowed us onto a packed Intercités that we hadn’t booked our bikes for travel on. In some ways we had an easier time on UK trains. A surprise to us given the bike friendly culture that exists in France by comparison. But it is improving in the UK, thanks to Sir. Wiggo, Froomey, the Tour de France and the Olympics. 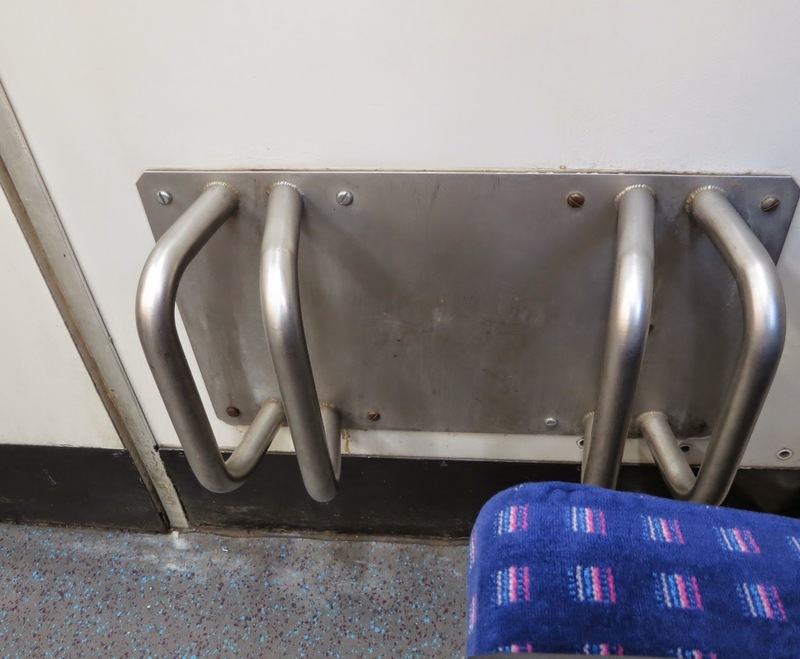 In fact we quite liked the bike racks on the trains there…..simple to roll the front or back wheel into their designated spot, and in our experience no hefting of the bike halfway up the carriage wall…..Oh, and their elevators are often big enough to accommodate bikes, a rare commodity in France – there were a lot of stairs to tackle I gotta say. I found a great resource for all things train related travel in Europe, bikes or no bikes. It led us to loco2. The Man in Seat 61 is a fantastic guide to travel by train in not just England but Europe in general. I’m sure he mentions it, but for the best deals on train tickets in the UK, go to The Trainline. We booked several months in advance, and got smoking deals. 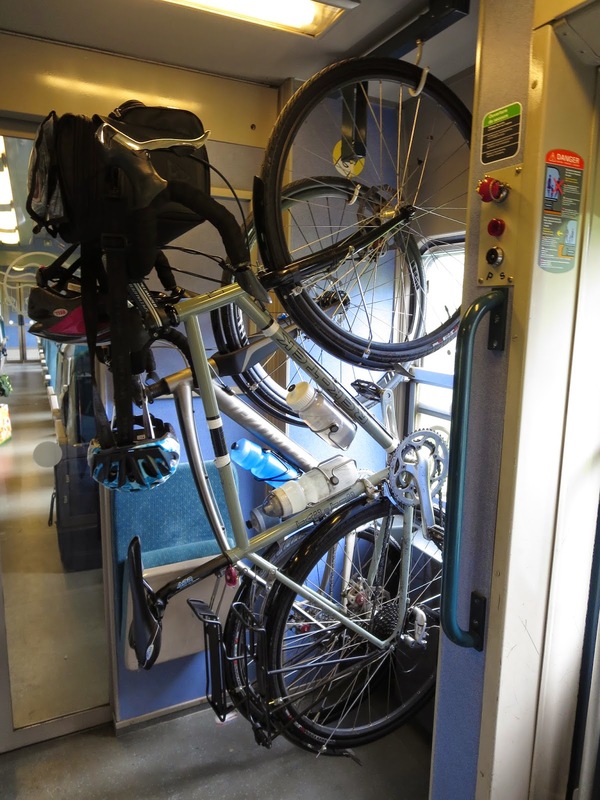 And it’s always worth checking the latest updates on bike travel on trains. We met so many people struggling with bookings, reservations and limited space that it seems it’s only (hopefully) a matter of time before things improve, bikes and trains go so well together after all. I just stumbled across something called CapitaineTrain, which, I don’t know, sounds kind of cool actually.